Going, going, gone. Just after 9:18 am, the 50-metre ‘Apostle’ collapsed within seconds leaving a heap of rubble. Jesus’ Apostles indicated the earth was young, and these Apostles do too. 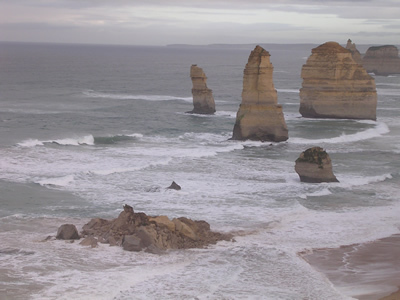 Geologist Dr Tasman Walker of Creation Ministries International said that the famous ‘Twelve Apostles’ off the coast of Victoria, Australia have eroded much faster than most people imagine. Australians were shocked to learn that one of the ‘Twelve Apostles’ crumpled into the Southern Ocean just after 9 am on Sunday 3 July 2005, leaving just a heap of rubble. A Sydney family touring the area captured remarkable before-and-after images of the disintegrated rock formation. The 50-metre-high sea stack, second from the viewing platform, began to shimmer and collapsed into a heap within seconds. According to geologist Walker, the reaction to the collapse illustrates how the public have been conditioned with geological ideas that do not match reality. ‘We are told that The Apostles started to form up to 20 million years ago when erosion gradually attacked the limestone cliffs of Port Campbell. No wonder everyone is surprised when one collapses. ‘But there was a similar collapse in 1990 when London Bridge, a natural rock arch to one of the stacks, gave way not long after people walked over it. Two people had to be rescued by helicopter. ‘About 10 years ago in Western Australia nine people were killed when similar limestone strata collapsed onto the beach during an inter-school surfing competition. ‘The stacks are not millions of years old. The limestone strata were deposited during Noah’s Flood, as the floodwaters flowed from the emerging Australian continent. 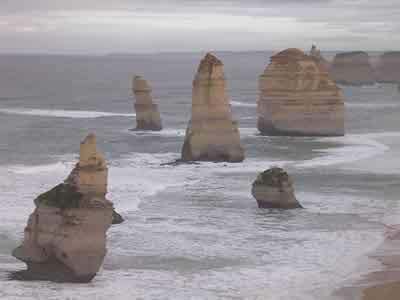 The Twelve Apostles are icons of the Australian landscape. They are featured around the world as a symbol of the Commonwealth Games being hosted in Melbourne in 2006. The changed landscape means the many photos and tourist promotions may have to be re-shot. Before the collapse, the Twelve Apostles numbered nine, but now they are only eight. It was almost like a building being demolished straight down on itself. The debris has turned the ocean muddy brown but the rubble is expected to vanish within weeks.